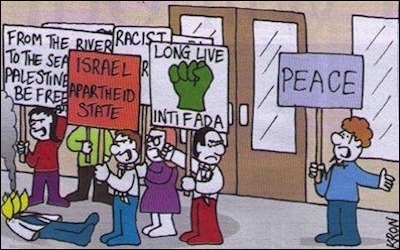 Since the creation of Israel, Palestinians, Arabs, and Muslims have been the mainstay of anti-Zionism, with the Left, from the Soviet Union to professors of literature, their auxiliary. But this might be in process of change: as Muslims slowly, grudgingly, and unevenly come to accept the Jewish state as a reality, the Left is becoming increasingly vociferous and obsessive in its rejection of Israel. Much evidence points in this direction: Polls in the Middle East find cracks in the opposition to Israel while a major American survey for the first time shows liberal Democrats to be more anti-Israel than pro-Israel. The Saudi and Egyptian governments have real security relations with Israel while a figure like (the Jewish) Bernie Sanders declares that "to the degree that [Israelis] want us to have a positive relationship, I think they're going to have to improve their relationship with the Palestinians." 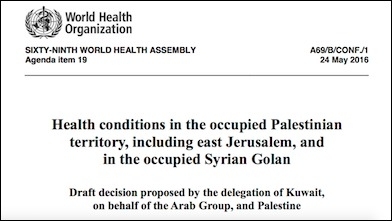 But I should like to focus on a small illustrative example from a United Nations institution: The World Health Organization churned out report A69/B/CONF./1 on May 24 with the enticing title, "Health conditions in the occupied Palestinian territory, including east Jerusalem, and in the occupied Syrian Golan: Draft decision proposed by the delegation of Kuwait, on behalf of the Arab Group, and Palestine." The Left is becoming increasingly vociferous and obsessive in its rejection of Israel. The three-page document calls for "a field assessment conducted by the World Health Organization," with special focus on such topics as "incidents of delay or denial of ambulance service" and "access to adequate health services on the part of Palestinian prisoners." Of course, the entire document singles out Israel as a denier of unimpeded access to health care. This ranks as a special absurdity given the WHO's hiring a consultant in next-door Syria who is connected to the very pinnacle of the Assad regime, even as it perpetrates atrocities estimated at a half million dead and 12 million displaced (out of a total pre-war population of 22 million). 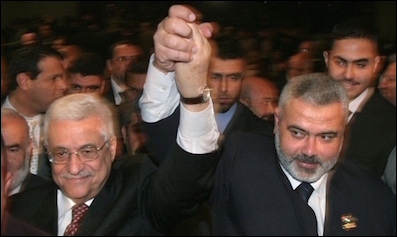 Mahmoud Abbas (left) and Ismail Haniyeh (right), pictured in March 2007, both had close relatives go for medical treatments in Israel. Conversely, both the wife and brother-in-law of Mahmoud Abbas, leader of the Palestinian Authority, whose status and wealth assures them treatment anywhere in the world, chose to be treated in Israeli hospitals, as did the sister, daughter, and grand-daughter of Ismail Haniyeh, the Hamas leader in Gaza, Israel's sworn enemy. Despite these facts, the WHO voted on May 28 to accept the proposed field assessment with the predictably lopsided outcome of 107 votes in favor, 8 votes against, 8 abstentions and 58 absences. So far, all this is tediously routine. But the composition of those voting blocs renders the decision noteworthy. Votes in favor included every state in Europe except two, Bosnia-Herzegovina (which has a half-Muslim population) and San Marino (total population: 33,000), both of which missed the vote for reasons unknown to me. To repeat: Every other European government than those two supported a biased field assessment with its inevitable condemnation of Israel. To be specific, this included the authorities ruling in Albania, Andorra, Austria, Belarus, Belgium, Bulgaria, Croatia, Cyprus, Czech Republic, Denmark, Estonia, Finland, France, Germany, Greece, Hungary, Iceland, Ireland, Italy, Latvia, Lithuania, Luxembourg, Macedonia, Malta, Moldova, Monaco, Montenegro, Netherlands, Norway, Poland, Portugal, Romania, Russia, Serbia, Slovakia, Slovenia, Spain, Sweden, Switzerland, and the United Kingdom. All but two European governments voted to support a biased field assessment with its inevitable condemnation of Israel. Making this European near-unanimity the more remarkable were the many absented governments with large- to overwhelming-majority-Muslim populations: Burkina Faso, Chad, Côte d'Ivoire, Eritrea, Ethiopia, Gabon, Gambia, Kyrgyzstan, Libya, Mozambique, Sierra Leone, Sudan, Tajikistan, Tanzania, Togo, and Turkmenistan. So, Iceland (with effectively no Muslims) voted for the amendment and against Israel while Turkmenistan (which is over 90 percent Muslim) did not. Cyprus and Greece, which have critical new relations with Israel, voted against Israel while the historically hostile Libyans missed the vote. Germany, with its malignant history, voted against Israel while Tajikistan, a partner of the Iranian regime's, was absent. Denmark, with its noble history, voted against Israel while Sudan, led by an Islamist, did not. This unlikely pattern suggests that monolithic Muslim hostility is cracking while Europeans, who are overwhelmingly on the Left, to the point that even right-wing parties pursue watered-down left-wing policies, increasingly despise Israel. Worse, even those who do not share this attitude go along with it, even in an obscure WHO vote. Muslims, not leftists, still staff almost all the violent attacks on Israel; and Islamism, not socialism, remains the reigning anti-Zionist ideology. But these changes point to Israel's cooling relations with the West and warming ones in its neighborhood.